Rotary trimmer features a CarboTitanium blade that's eight times harder than steel to smoothly cut up to 10 sheets of 20 lb. paper. Its unique lever design allows the blade to cut cleanly through various materials for precise cutting. Secure locks at each end of the cutting rail hold your papers down to ensure straight cuts. Alignment grid and onboard measurements in Imperial and metric help keep your cuts consistently accurate. EZ-change, push-button release quickly detaches the blade for fast replacements. Plus, the handy compartment offers a convenient location to store your spare blades to ensure they're always within quick reach. 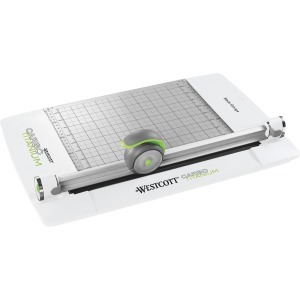 Paper trimmer is perfect for cutting paper, cardstock, photos and more.